Find everything you need for a fantastic stag party in Hawkes Bay. We can help you plan and book a complete weekend of fun. Why You Guys Should Have A Hawkes Bay Stag Party! Think Hawkes Bay and automatically we think of wine and food. That means that amazing bars and restaurants are everywhere. What more could you want for the ultimate stag do? This seaside city is a fishing and water sports paradise for the energetic as well as a relaxing utopia for those wanting to experience gourmet meals, delicious wine and boutique beers. The Hawkes Bay is a great place to party any way you want it! you’re going to indulge over the stag weekend, it might pay to just take a bus and that way you can just sleep it off on the way home. The Most Awesome Hawkes Bay Day Time Stag Party Ideas! 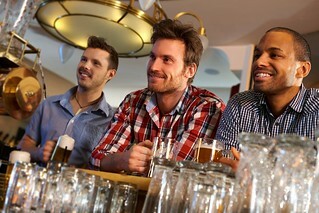 Try these action packed stag party activities for size to keep you guys occupied. So you don’t want to shoot at each other? That’s fine. This time it’s the clay birds who are the victims. Let’s see who’s the best shot as an experienced instructor shows you what to do and how to fire safely. Even if your stag party have never been shooting before, this activity is always lots of fun to include in a stag weekend so pick up a shot gun and blast away at the target. You might just hit it. Pull! What’s better than racing cars for a boys’ weekend away? Burn rubber legally with sprint car racing and get the adrenalin flowing in this day time stag party idea. Just give us the numbers and we’ll get it all sorted so all you guys have to do is show up, put your foot down and go! Although, we do advise that you try not to crash or the bride will be pissed if her groom’s broken and bruised for the wedding photos. Once you’ve got your heart racing with our awesome day time stag weekend suggestions, you’ll be ready to party up large and this is all that you’ll need! Jump on board the party bus and let them take you to heaven…or at least to the very best bars. This bus will ferry you around the best pubs in the region as you sit back and enjoy the ride. All you need to worry about is the partying. This is a Hawkes Bay must do activity for any stag weekend. Trust us when we tell you that the groom will not be disappointed.